2nd Tank Army's 1st Battalion, 1441st SU Regiment, 1/307th Tank Company, 208th Flak Company, 5/1441 Reconnaissance Company (Confident, Trained), 89th Guards Mortar Battalion (Fearless Trained). A total of 15 SU-122's in 4 Batteries, 10 T-34's (5 76's, 5 85's), 8 Katyushas, 2 DShk AA trucks in 1 battery, 3 ZSU 17's, and 5 Recon Rifle/MG teams. Mission: Breakthrough. Each side places one objective. Attacker wins if he takes either objective. Defender starts with half their Platoons off board. Attacker starts with at least 1, and up to half of his platoons on a flank march. April 1945, West of Erfurt, Germany. Snow is still on the ground, but muddy conditions exist. All hills and fords are bog checks, all streams are skill checks. 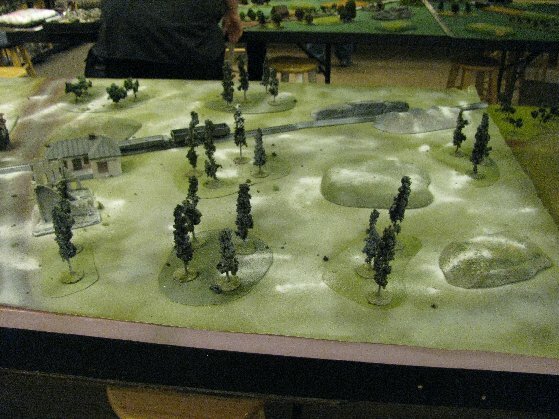 This mission has the Soviets set up on the right side of the board, and the Americans on both corners. The Objective is in the unoccupied corner. View from the left edge of the board. The Americans deployed on the far left side of the board. Soviets are off camera to the right. Another Platoon of Wood Elves near the center of the board. Shermans with 76's are behind the hill. 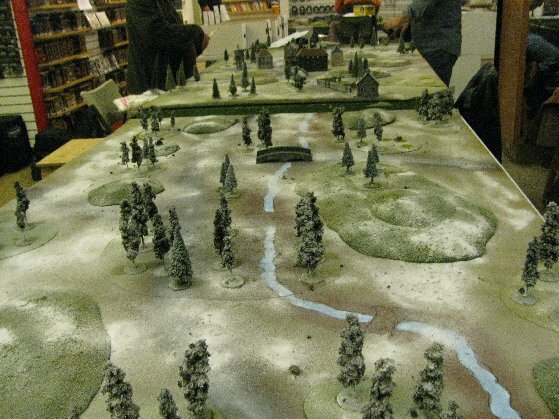 Soviet deployment on the right side of the board. The 3/1441 and 4/1441st SU Batteries, the 89th Guards Mortar Battalion, and the 208th Flak Company. Hefting himself out of his tank, Kapitan Petrov surveyed the terrain around him. It was a cold April morning. Icy snow was still prominent on the landscape. Like some great baker had just dusted the ground with corn starch. But the ground was warming and the snow was treacherous and slippery with mud. Not the Rasputitsa currently afflicting Mother Russia, but bad enough. The war was almost over, and his thoughts were no longer about killing the enemy, heroics and glory, but to just survive the damn thing. The stream ahead was running fast, providing little areas to cross. He sent half his force on a sweep to look for better ground and to “liberate” as much of Germany as possible. That was the game now. The Westerners were out there, taking the Bosch from behind. They had the easy job. They sat on their damn island for 3 years while we bled in our millions. Then 10 months ago, they land in the middle of summer and race across France chasing a defeated enemy. Even then they took their time. They stopped advancing in September. What is this, a part time war? But now that we are in Germany proper, they were back in the race again, occupying the Ruhr and northern Germany. While we still bleed in our millions. Kommisar Ivan Inanovitch Ivanovsky assured him we will be fighting them soon. The Germans have collapsed, and they will take us while we are weakest. Petrov hoped not, but if so, then let them come! My main strategy is to rely on the flank march. If the 1/307th Tank Company, with 9 T-34's show up on time, I can be sitting on the objective before the infantry can approach or dig in. 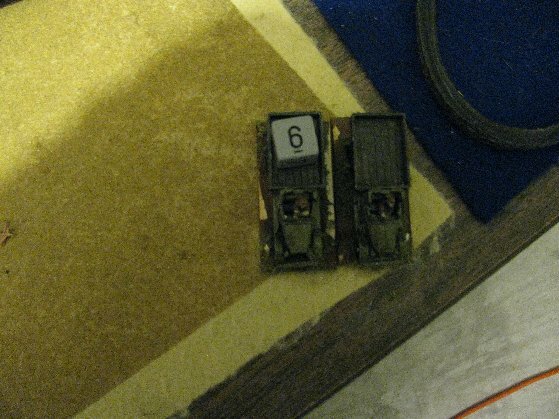 In addition, I intended to pin the Shermans in the center of the board in place to defend the other objective, but sending my two SU batteries at the stream. I had no intention of getting close unless the Shermans depart. 2 Batteries of SU's posturing at the stream. A road side attraction of the Worlds Largest Glue bottle is in the forefront. Kapitan Petrov had sent the 4/1441st battery to check if the ford ahead was passable. They should be reporting soon. Then the concussion of guns hit him. “’Tchyo za ga ‘lima?” swore Kapitan Petrov. He had good hearing, and he like to think he could distinguish between a German 75mm PaK from a Panther, and could certainly tell the difference between the sharp 5cm crack, and the boom of a 105. This sound was different. It was certainly in the 75mm range, but lacked crispness of German munitions. There followed other explosions he knew too well. The sound of hot 122 ammo brewing off. He took the radio headset from his radioman. Not the one assigned to him, but the one he acquired late one night many months ago. This radio was tuned to frequencies used by the Guards units. Sometimes it was his only reliable source of information. “Corporal Dryagin, report!” commanded Kapitan Poritonski. This was good, for Petrov knew from experience that Dryagin was one of the Guard’s spotters. They tend to be on high ground, and have binoculars. “Comrade Kapitan! I am observing our SU Batteries at the stream taking fire and it looks like all of them are burning! I see enemy tanks along the woods in the distance, passing the coordinates now." M4A3's take a long range shot, with stabilizers, and totally destroy the 3/1441 SU Battery. One Platoon of Wood Elves already hold an objective. "No plan survives contact with the enemy." That applies here as well. 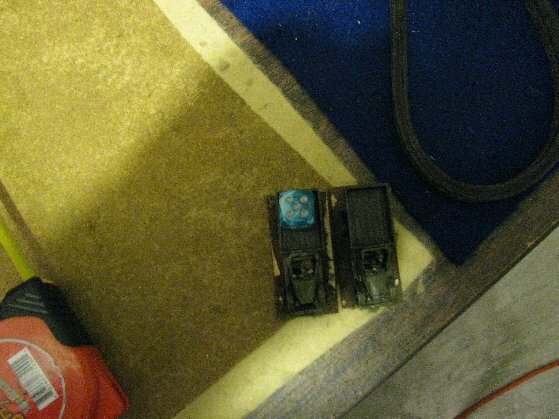 With two batteries of SU's I could challenge the Shermans, but with only one, no. I decide to pull back out of sight but in a position to challenge the center objective if an opportunity presents itself. If my flank march arrives as soon as possible, I can still assault the far objective, then squeeze the Americans from front and back. The Americans did a good job of keeping to cover, and I was unable to sight anyone from my spotter. I have trouble with WYSIWYG terrain. I can't image that a hill is not taller than the trees around it, and can't cant see over them. So my spotter can't see over all the woods despite being on what I envision as higher ground. So I move him to a better vantage point. 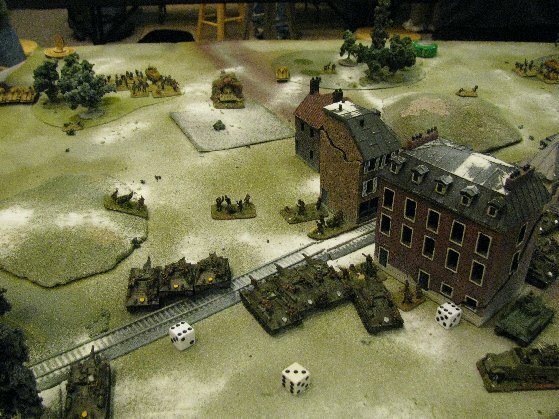 Americans roll reserves and takes the tank destroyer platoon. Robert realizes my limitations, and knows I can't seriously challenge the middle objective with what is on the table, and pushes his Shermans to the other objective. I get one break though, the left most infantry platoon, failed it's skill check to dig in. If my tanks come on turn 3, I could kill on average 4 teams from MG fire, and a few more from the Kats. Turn 2, and the Americans are already on the objective. 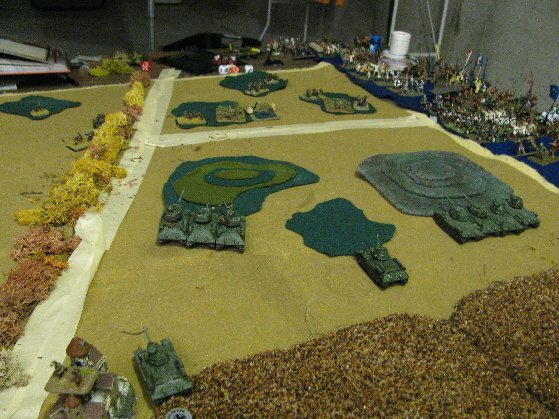 Tank Destroyers arrive in the upper right side of the picture. Sorry, no pictures. I rolled my reserves, and both Robert and I saw the 5 up as the dice slided before hitting something, and it turned to a 2. Easily the game hinged on that die roll. The battle was still going to be on the left flank, and I started redeployment of my on table assets to support the left flank. Americans roll reserves. A jeep recon platoon. They drive up to my spotter, and hose him with 12 dice of .50 cal fire. Ending the career of Corporal Dryagin, and effectively taking out my Katyushas. Soviets roll reserves. Kapitan Badinuff's 1/307th T-34 Tank Company arrives. They line up for what will be the do-or-die assault for the objective. 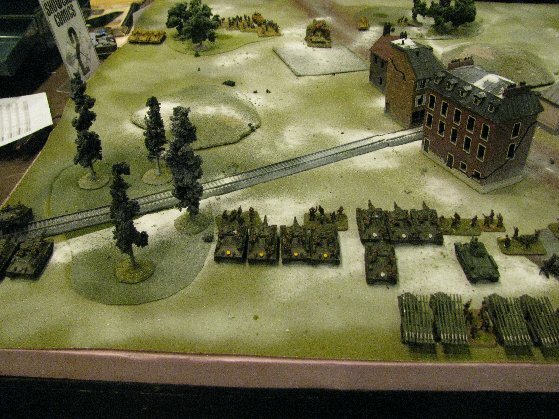 But the Americans are prepared, and while my MG fire pins them, they are largely unhurt. 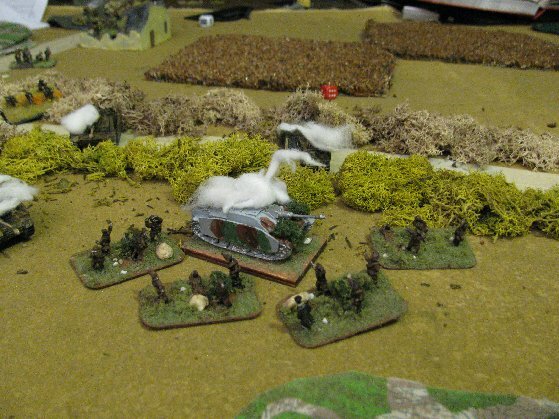 The assaulting tanks have one killed and 2 bailed, and so retreat. 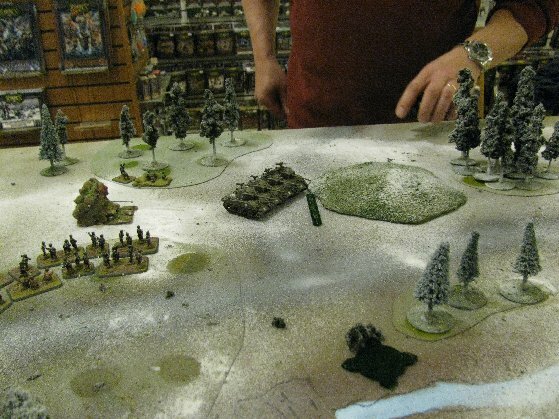 Off the bottom of the picture frame, I try to get the 208th Flak Company to engage the Jeeps, and kill one. 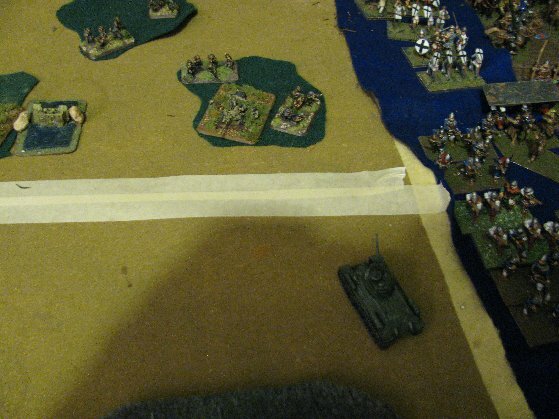 The on board Shermans destroy one of my on board SU's, then the Americans pop the Tank Destroyers, and between them, and 5 bazookas, take the 1/307 to its motivation level, which it fails, (for the first time ever) and flees. At this point I resign. 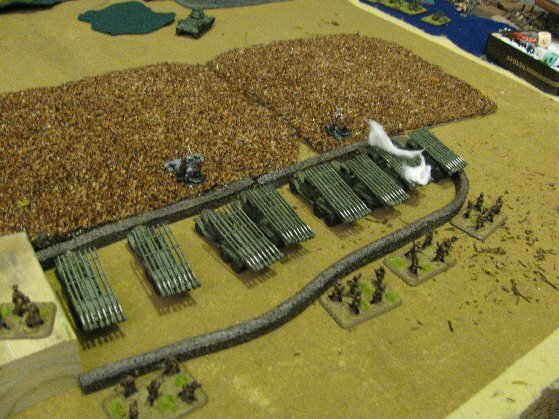 Turn 4, after the assault, but before the TD's pop, which they will, at the top of the hill. Not much to see here. All the targets are off the bottom of the picture. Know your enemies capabilities. Knowing the double timing infantry might have changed the plan. Lead with the T-34's. While this Battalion wins on the force of its SU's, this only works using the T-34's as a shield. This plan was faulty in that I had most of my points off board, in delayed reserves. Giving my opponent both the terrain, and local superiority. Apology redacted as inaccurate and unnecessary. German (Confident, Veteran) CiC, 2iC each with panzerfaust, SMG in a half-track. One Full Aufklärungs Platoon with panzerfaust and full half-tracks. One Reduced Aufklärungs Platoon with panzerfuast and full half-tracks. Two Platoons of 3 Pumas, one Platoon of 3 pak38's, one Platoon of 4 StuH42s, one battery of 4 15cm sFH18 howitzers. The company had limited Air Support from a squadron of Hs 129B's. Mission: Fighting Withdrawal. Prepared Positions. Each side Attacker places two objectives. The defender, one. Attacker wins if he controls any objective by turn 6. Early 1945, the Town of Erfurt, Germany. Snow is still on the ground, and muddy conditions exist. All hills and fords are bog checks, all streams are skill checks. A rail station near the town of Erfurt. 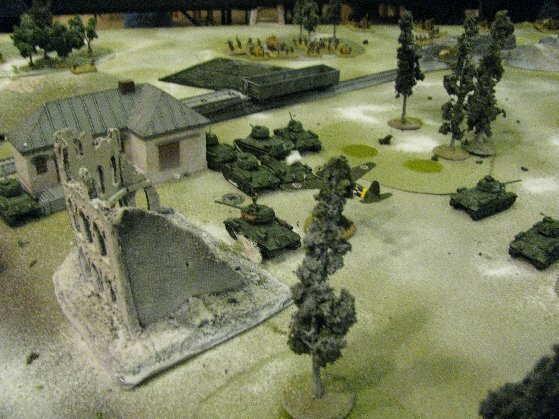 Germans will be deploying on the left, Soviets on the right. A closer view of the Soviet right side of the board. The Soviet left side of the board after deployment. 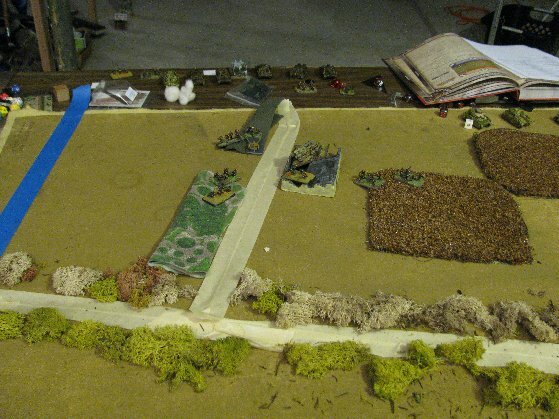 I am going to try to rush the nearby objective, while screening the German forces on the center and right. 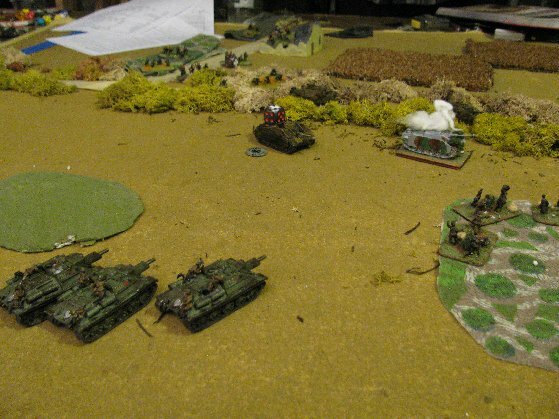 Visible in the distance are a German Puma Patrol, an Infantry Platoon, a Kampfgruppe of one Puma and the 2IC, and the objective. 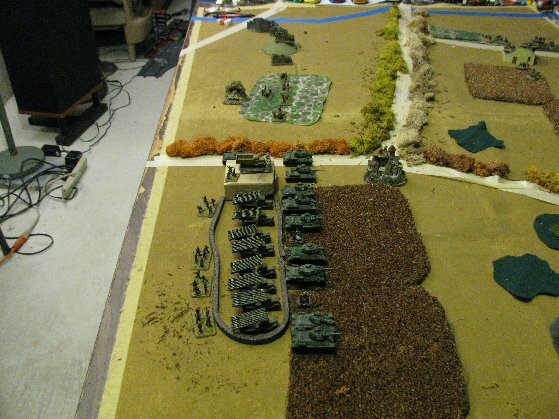 The visible Soviet forces are 3 Batteries of SU's, an Infantry Recon Company, and the Katyushas. 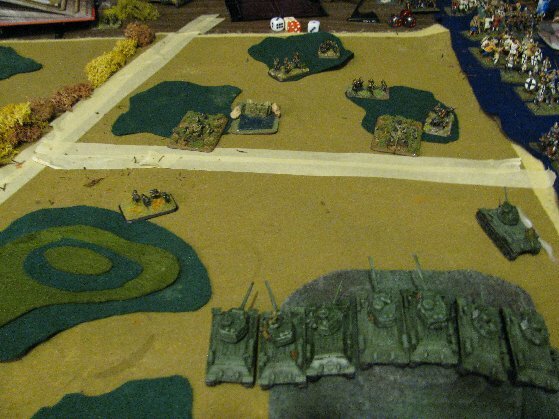 The Soviet right consists of another Battery of SU's, and the 1/307th Tank Battalion. 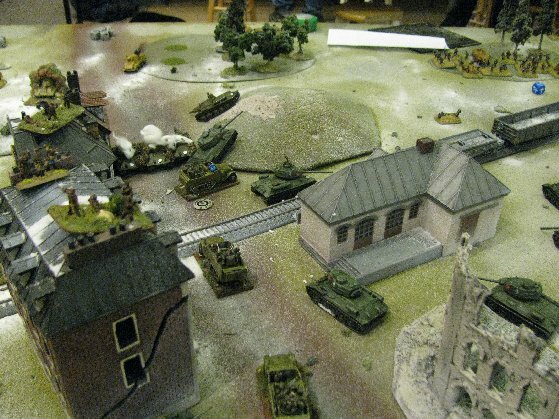 German deployment on the Soviet right. Two Platoons of Infantry, 2 Pumas, 4 155's and 2 objectives. ﻿"Muddy Hell! ", thought Kapitan Petrov, "Yes, the ground looks like it was iced over, but that ice was only a centimeter thick, and his tanks broke right through it. A frontal assault was pointless in this situation. This operation was insane." But Kommisar Ivan Inanovitch Ivanovsky had assured him the enemy was pulling out, to redeploy elsewhere, and so there wouldn't be much of a fight. But Petrov wasn't so sure, the Bosch constantly did unexpected things. My strategy was simple. 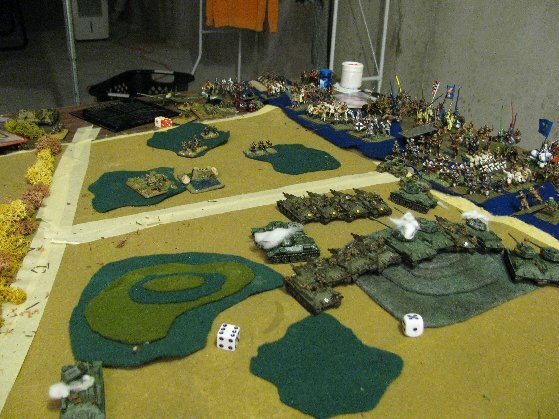 On the right I would keep his forces focused on the 1/307 Tank Company, and on the left I would assault the objective. 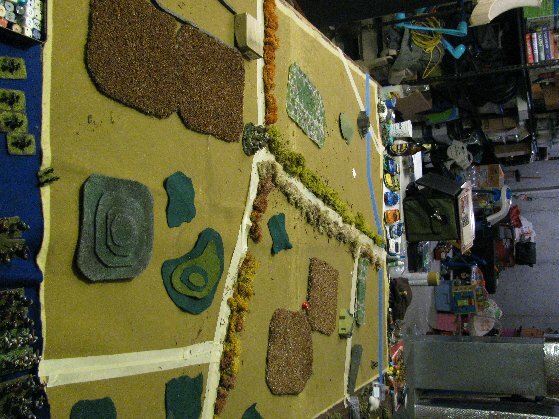 The only problem was the terrain. 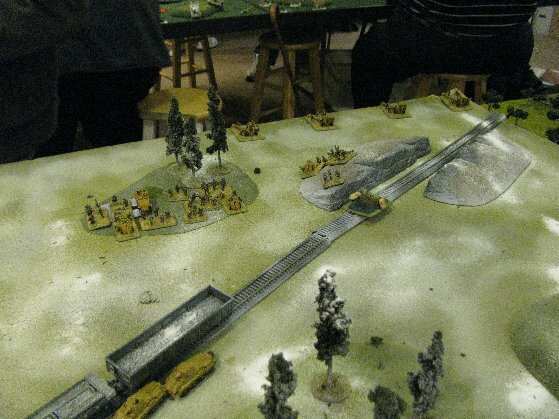 The rail line was all the way across the board, and the terrain severely limited any shooting lanes. I pushed my recon as far as it could go. Trying to reach the far woods in my 8" no ambush zone, but Miles would have none of it, and popped the ambush of 4 4 Stu42's on his turn. I had a piece of luck, getting 3 shots on a Puma Platoon, and even with "Hens and Chicks", managed to burned one. 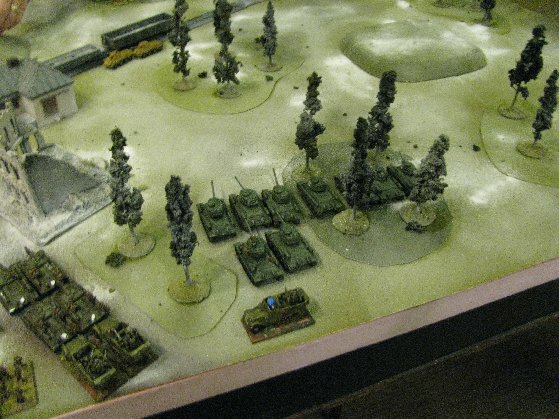 The Germans had 2 Puma's on my side of the tracks, but when they saw they were facing 9 T-34s's retreated behind a hill. His two remaining Pumas on the left flank rolled well and killed 2 of my SU's. 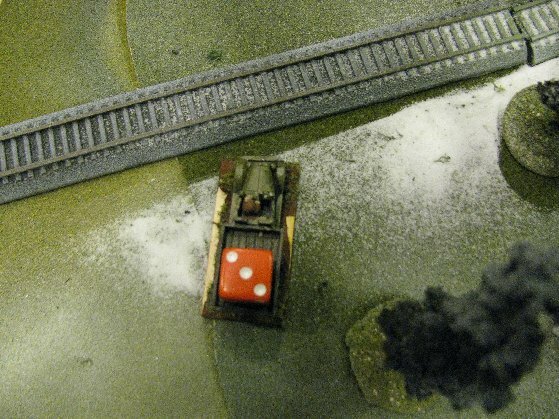 The 155's battery ranged in on the 1/307 Tank Company, but to no effect, while his Flying Tanks tried to take advantage of my condensed formation. 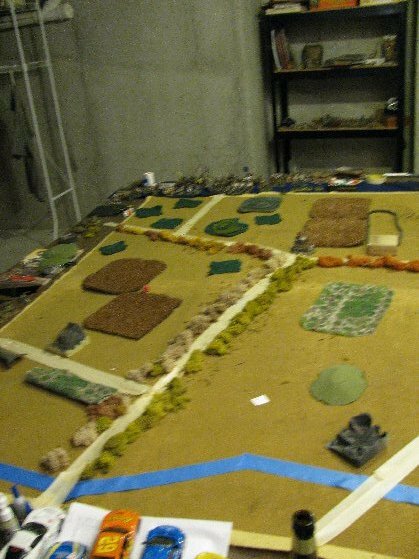 I have taken this into account with my Regiment design and brought the 208th Flak Company with me, while the 89th Guards Mortar Battalion also has another 2 dedicated AA teams. 20 dice later and is 2 HS-129's went down in flames. 3 SU Batteries advance, with the scouts in front. In the town, another SU Battery advances. On the hill, a nervous spotter squats, and off in the distance, a single Puma sets it sites. His 155's found their range and managed to pin a T-34, while another airstrike avoided the Flak Batteries and killed a tank. 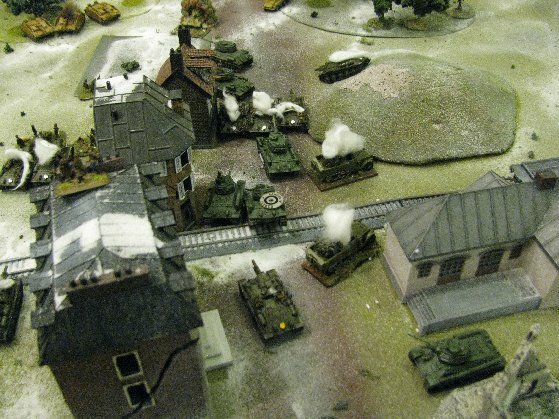 While his 2 lost Puma's tried to run around to board edge to get flank shots on the 89th Guards Mortar Battalion. Now the hard decision. Move forward and suffer "Hens and Chicks" and hit him on a 6 only, or stay at long range and double fire. Air action North! No AA here. 2 Pumas trying to sneak around the flank. Now I was getting distracted. There was that 155 spotter on the hill, and all I needed to do was assault it. Unfortunately, I didn't have the movement to reach him. 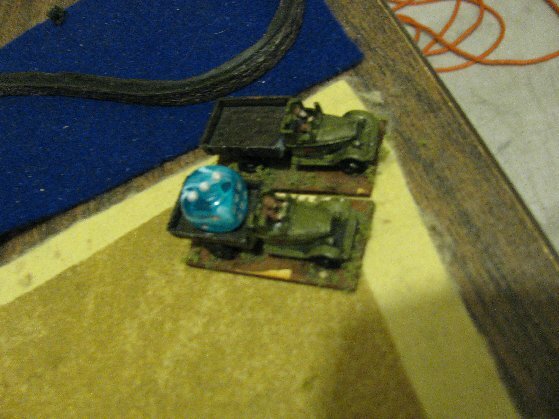 I did have the the 4/1441st Battery kill the Puma that was part of the Kampfgruuppe. But that was pointless, as he was set to remove that platoon anyway as part of the conditions for "Fighting Withdrawal". The Katyusha's rain down upon the Germans. This was a case where the wrong part of the devastation template did matter. Sorry Miles. 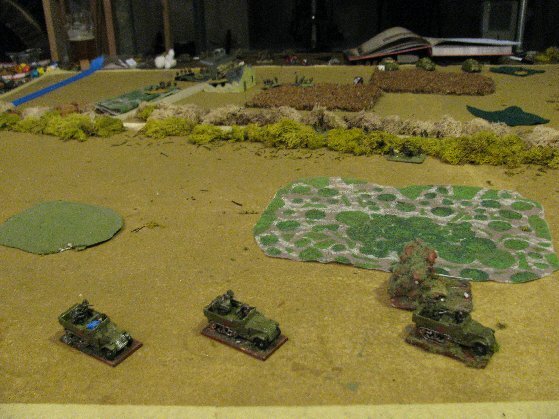 I was targeting the Stu42's and including the 7 stands of infantry in the barrage. Eventually I would crack the Infantry using this tactic. But lose a battery in return. To avoid the 155 Barrage, I started stretching out the 1/307 Tanks Company. 9 tanks at 6 inch intervals stretches a long way. Two tanks covered the flanks should the 2 Pumas return, all the way to where I can get a shot on the Spotter, eventually killing him on turn 5. Almost the entire Company within two inches of a building or wood, so that the next air strike failed to range in. But my SU Batteries were spent. One battery fled, another was down to one gun. An air strike braved the AA and picked up the third. The HS-129's pick up a battery. 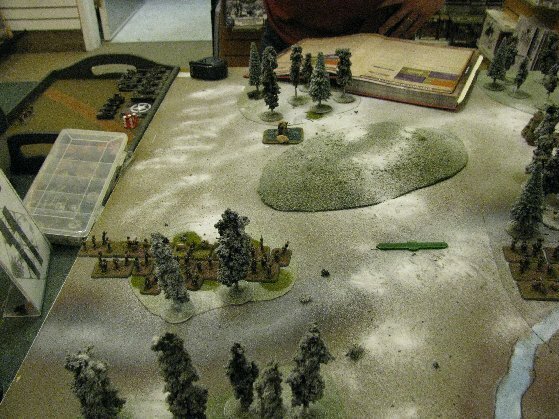 In the background there is a lot less infantry covering the objective. The situation is really not tenable anymore. I managed to kill the spotter, but his CIC was able to fill the void, and call in more artillery on my remaining battery of SU's. I may be able to contest the objective, but he will pick it up next turn and then I will not be able to switch to another one. His Stu42's were totally intact. and with that his AT ability was almost untouched. So even though I manage to wipe out his infantry platoon, and on turn 6 his CIC, there was no chance at a win. 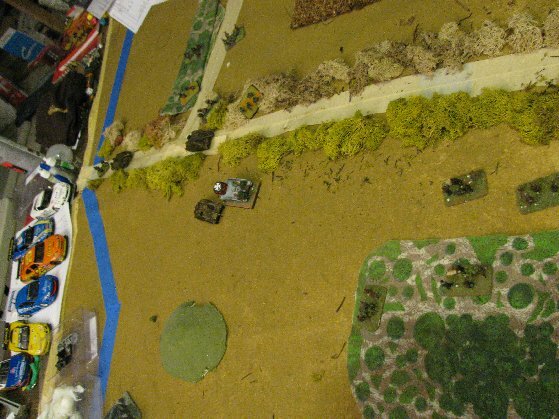 Still running down the Spotter, off to the right, and managed to MG him down as he fled. But the guns were ranged in right on the center of town. Final. The wreck of the 1441st "STAVKA", "Red Banner", SU regiment. a 2-5 loss. SS Wiking (Fearless, Trained) 2 Platoons of Grenadiers, 1 Platoon of 3 PaK 43’s (which was broken up and parsed to the Grenadiers), 1 Platoon of 3 Panzer IV’s (containing a Kanon), 1 Platoon of 2 STG's (also containing a Kanon), 1 Kampfgruppe of 2 STG's, 1 Reconnaissance platoon of 3 armored cars, and limited air support. 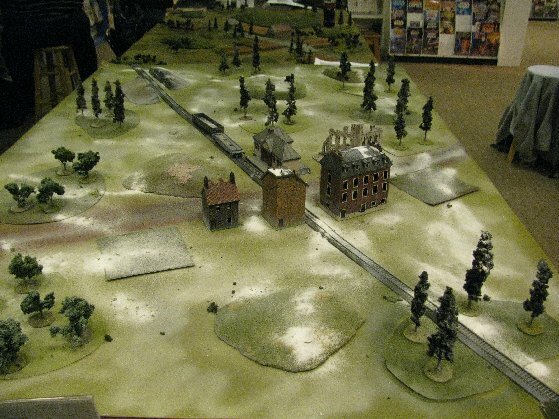 The Mission: Encounter, The Germans rolled to be the attacker. Though, if you look at the mission, it doesn't matter who is attacking and who is defending. 2 objectives are placed in both the defenders and attackers area. Each side has half their force in scattered, delayed, reserves. Winner is he who can control either objective on the opposite side of the board. A minor crossroad along the stream near Vyazma. A countryside area of fields, roadside hedges, woods and rises. 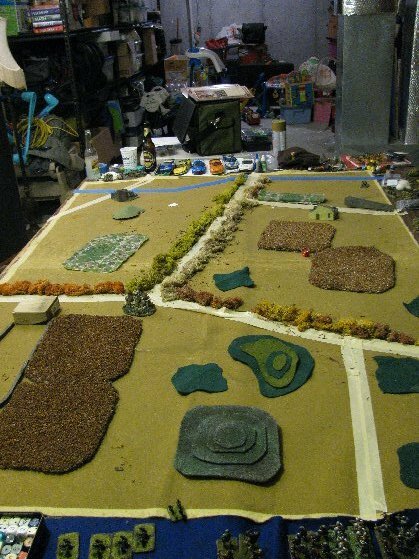 The 1441st SU Regiment will be setting up on the left, "East", edge, the Wiking SS on the right, "West" edge. Reverse view above. 1441st SU Regiment right, Wiking SS left. Both Ed and I are practicing for an the upcoming tourney, "White Out" and we know they love their bocage. 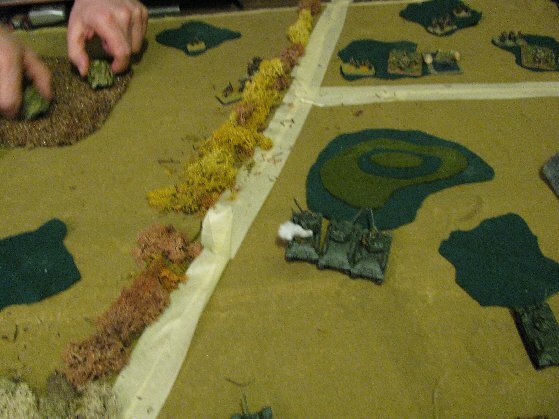 So the hedges along the road were considered bocage, even though this is very un-Russia like terrain. This had the effect of splitting the board in two. We each had an objective on each side of the split. 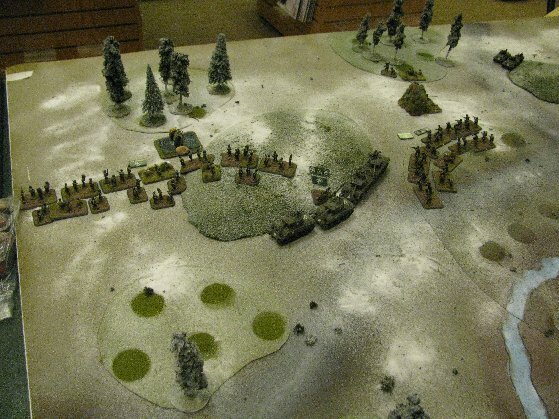 I decided to make a play for the right most objective and placed Boris Badinuff's 1/307th Tank Company, backed by Kapitan Poritonski's Guards Mortar Battalion. This left my AA and Recon Companies to defend the other objective. 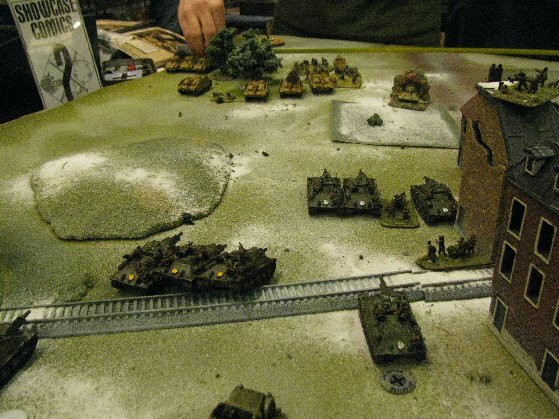 The Wiking SS had one Grenadier Platoon defending each objective, their Panzer IV Platoon, in between. 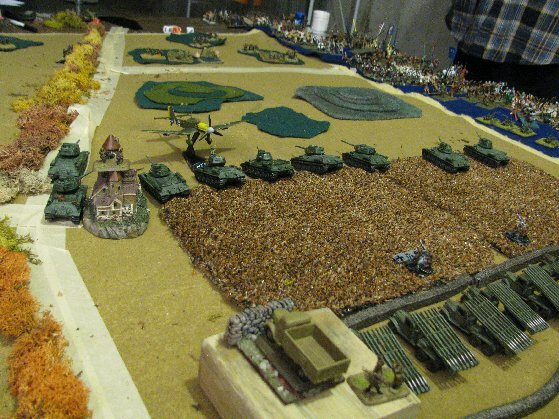 Soviet Deployment, weighted right. T-34's in front, 89th Guards Mortar Battalion behind. 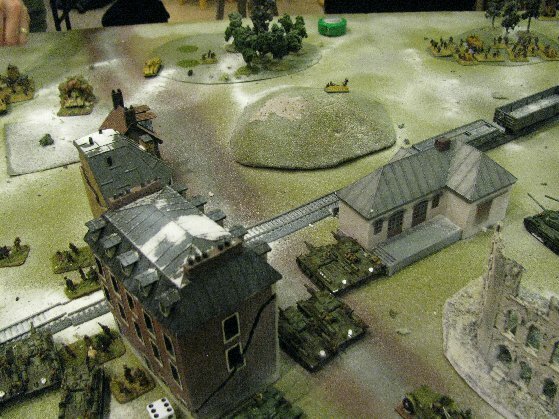 German Deployment. Pretty much center line. 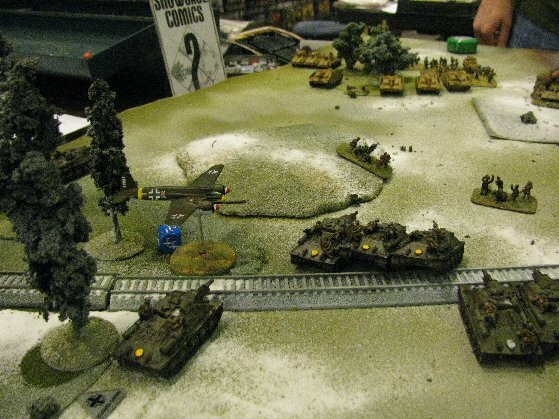 One Platoon of Grenadiers on each objective, and a response team of 3 Panzer IV's. The Kanon had been decorated with the Knight's Cross with Oak Leaves, allowing "Full Rate of Fire when moving" to go along with his "Re-roll Failed Skill Checks." 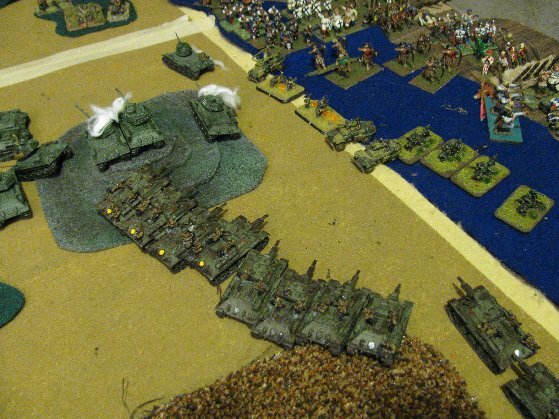 Soviet Deployment left. 3 ZSU-17's with quad .50 cals, and the 5/1441 Reconnaissance Company. German deployment left. A Grenadier Platoon backed by a PaK 43. "Men", commanded Kapitan Petrov, "We have an opportunity." "As we continue to encircle the Bosch in Vyazma, we have split off some of his forces, and can defeat them in detail." "While most of the enemy are defending the ground further afield, we can take a key objective nearby, forcing them to come at us piecemeal, where our guns can grind them into dust." "I know our SU's have not yet arrived from resupply, but Kommisar Ivan Inanovitch Ivanovsky, has gone to expedite their return. Badinuff's tank company will pin the enemy till they arrive, and with speed and daring, we will secure a victory for Mother Russia!" 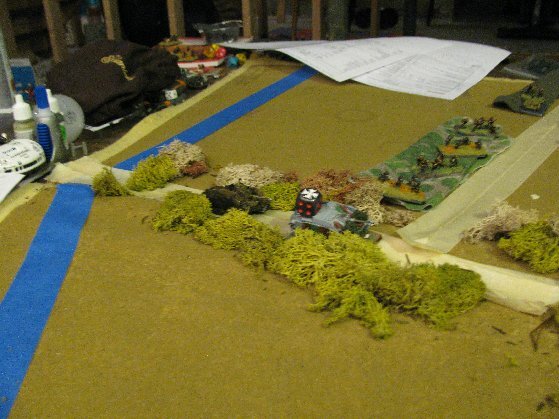 I don't intend to fight on the left side of the board, and I didn't think the grenadiers on that side were going anywhere either, so I pushed the 5/1441st recon company to the hedge line, just to posture. 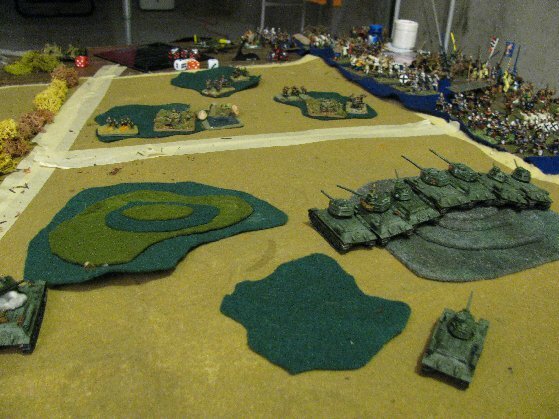 The 1/307th Tank Company began their hub to hub charge, but were slowed by the wheat field. 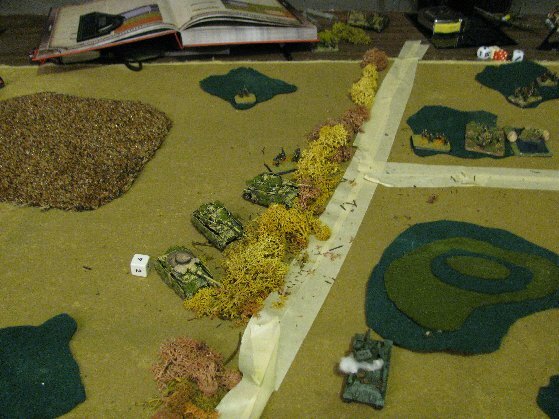 I am relying on the road side hedges to keep the Panzer IV's off my flank. And with this mission, there are no ambushes. 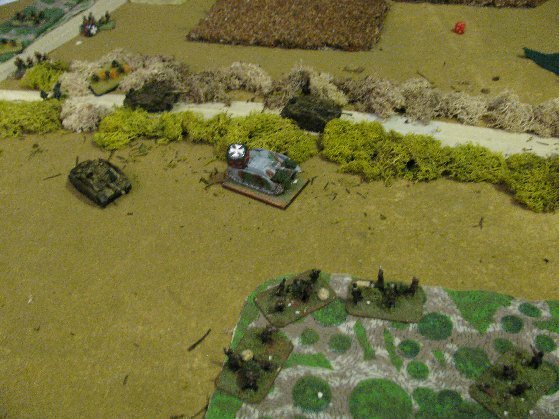 The Wiking SS adjusted their Panzer IV positioning to compensate, but the other forces just waited. (note to Ed, you probably should have dug in.) The Luftwaffe made an appearance. 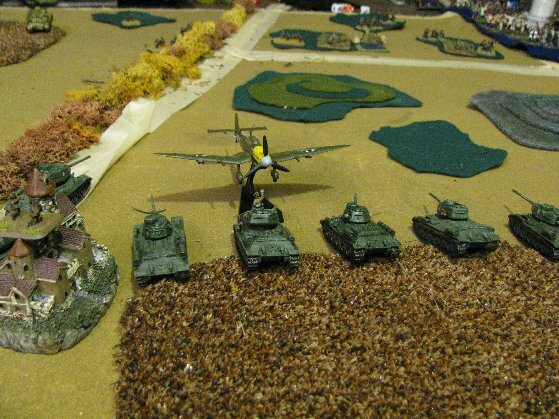 Two planes arrived, one was shot down, the other bailed a T-34. Retiring the 208th Flak company, closer to the Kat's. First air strike right on cue. One plane was shot down, the other caused a bail. I know I am relying on a massive tank company to carry the day, and it can take a hit, then punish my opponent afterwards. 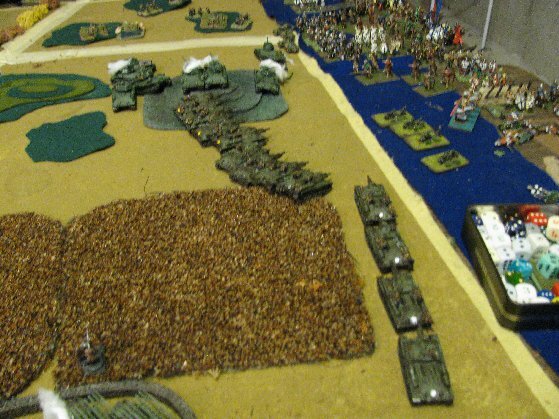 But after measuring the distances, I couldn't get to 16 inches with all my tanks on turn 2. If I am going to give his 2 PaK's the first shot, at least I want my return shot to be worth while. So I decided to get ready for turn 3 by taking cover behind the hills and woods. The 1/307th take cover from the PaK's. But I forgot about the gap in the hedge. The German platoon leader has another notch for his barrel. No Soviet Reserves arrive. Kapitan Badinuff's tank company take up firing positions on the hill near the Grenadiers and their PaK's. But as I am outside of 6 inches, there are no targets visible. German reserves arrive. A pair of STG's, one of which is commanded by a warrior decorated with the Knight's Cross with Oak Leaves. He arrived on the left side of the map, suddenly making one of my objectives vulnerable. The Luftwaffe also made an appearance, and blew up a Katyusha. Safe from the gap in the hedge, which is off camera to the left, but not in a good position to shoot either. The Luftwaffe bags one Katyusha. The Grenadiers,emboldened by the arrival of a pair of STG's, join them in an attack on my objective. ﻿﻿﻿﻿﻿﻿"Hurry up, he says! You don't need a full load, 20 rounds of is enough, he says! Head to the sounds of gunfire he says! What gunfire? 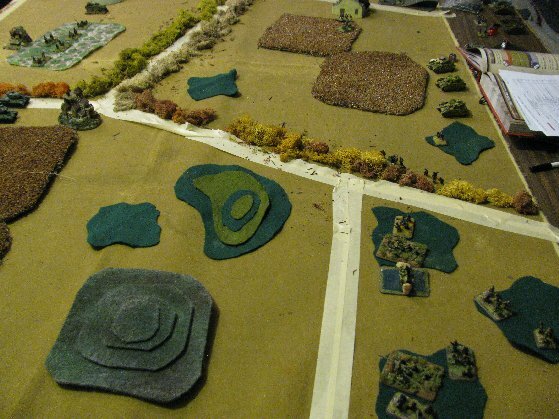 I have heard more noise coming from a fly fart" complained Leytenant Koning, platoon leader of the 1/1441st SU battery. Soviet reserves arrive. A battery of SU's on the right corner of the table. The tactical problem is this: The enemy is invisible to me unless I get to within 6 inches. If I approach to 6 inches, "Hens and Chicks" means I have a ROF of 1 with a +1 to hit. 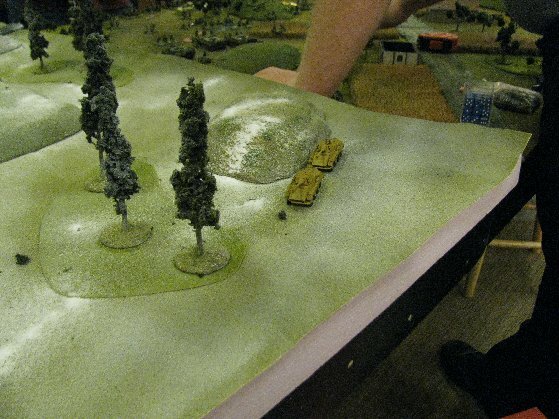 Also, the Grenadiers can surprise my tanks by assaulting from the woods. Then my surviving tanks finally get to shoot back. This is a bad plan. Lets see if I can fish him out by approaching with one T-34 to 6 inches. German reserves arrive. Another pair of STG's, following the first. The race is now on on who can secure an enemy objective first! I have nothing that can deal with the STG's on the left, and I realize that the hedges would keep me from reinforcing that area. Worse, only fully tracked vehicles can cross the hedge so my AA Company is trapped. Not all of the 5/1441st Recon Company manage to get back to the safety of the woods but the STG's MG's shoot wide and miss. 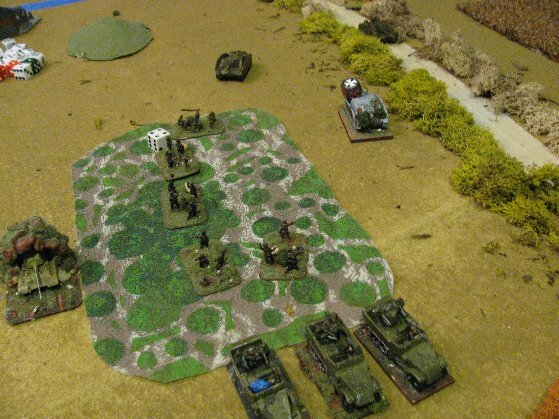 The PaK's step out of the woods and blow up the fishing T-34. Then "storm-trooper" back into the woods. * What??? Consult the rule book. It doesn't matter if the PaK's shot in turn 4, they are still not visible on turn 5. This is why you might not want to be seen. 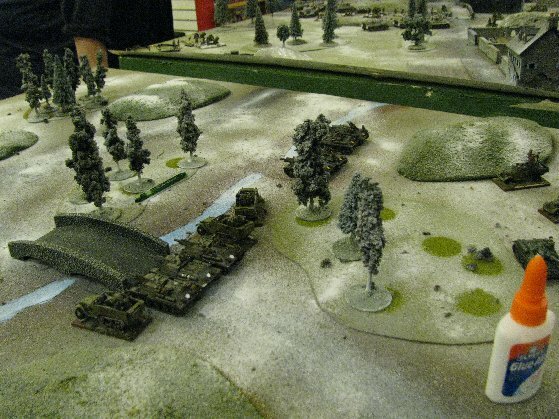 The Panzer IV's take up position on the hedge line, but this is a standoff as no-one can see anyone right now. Soviet reserves arrive. Two more batteries of SU's. Both on the right hand corner. Since that corner is at a standoff right now, I'll wait till they get into position and then charge the objective. While my objective is being assaulted by the STG's, I think it will still take 3 or more turns for him to secure it. German reserves arrive. An armored car platoon reinforced with some foot troops armed with Panzerschreks. 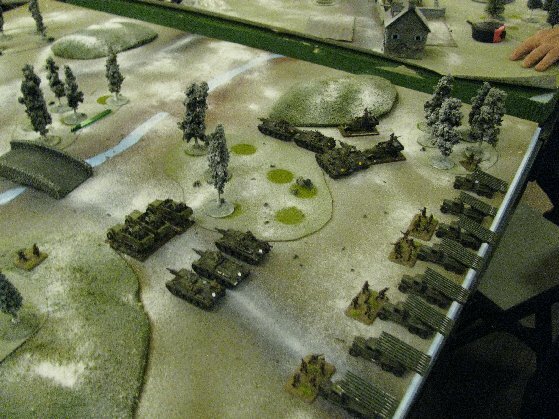 They also arrive on the Soviet right flank. 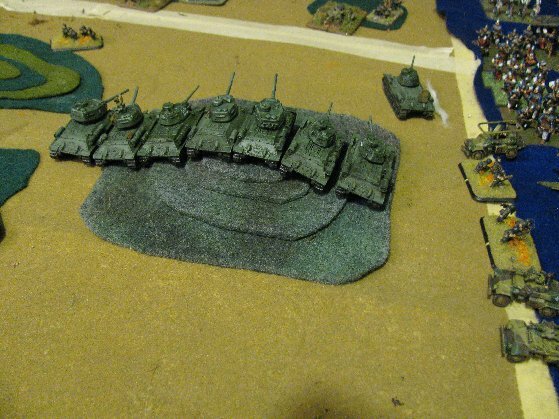 The schreks do their thing, and kill two more T-34's. This is a mixed blessing. They may hurt my tanks, but offer me a cheap platoon to kill. 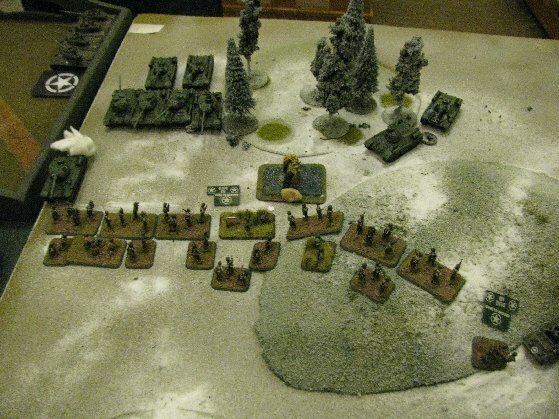 German armored cars and Panzerschreks arrive on the right flank of the 1/307th. And to add to the hurt, the PaK's are rolled out of the woods. 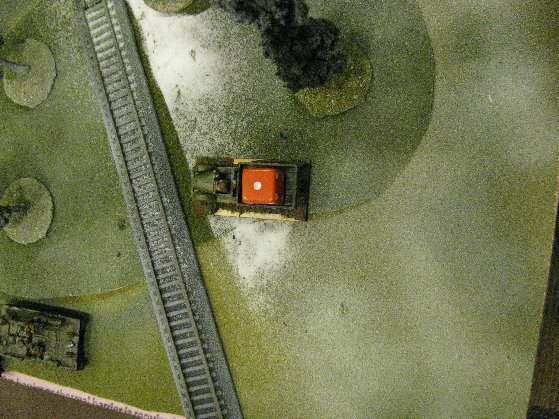 The STG Warrior lines up a shot on the AA guns and kills one. One of the recon teams is also Machine-Guned down. Soviet reserves arrive. The last battery of SU's arrives on the left side. I'll get three flank shots on the one platoon of STG's, while lining up an assault with my recon teams. 3 shots, 2 hits, 1 bail, 1 killed. But I measured poorly setting up the assault as the bailed survivor was 6 and a smidgen inches away and out of reach. On the right flank, the SU's get their first shots on the Armored Car Platoon. 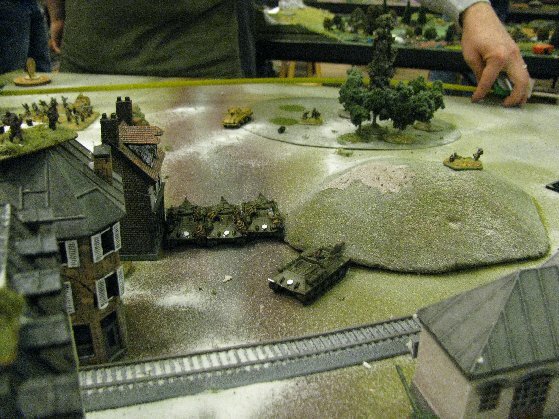 The cars themselves make their skill check and vacate the area, leaving two guilty faced infantry teams holding smoking tubes of spent panzerschreks to face down 3 batteries of SU's. 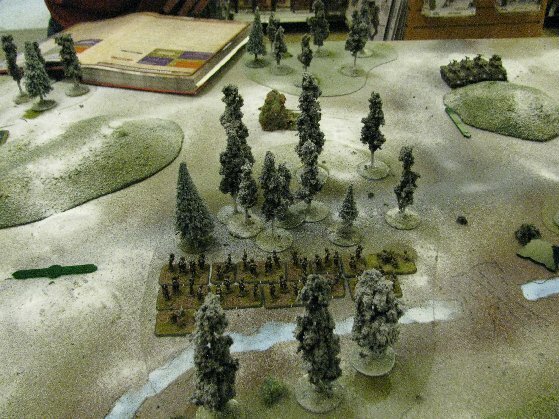 The 5/1441 Reconnaissance Company prepares to assault the STG's. The 4/1441, "Grey" battery arrives. Flaming the STG Kanon, and bailing the other STG. The men of the 5/1441 Reconnaissance Company breath a sigh of relief as this is a case of "shot too well" and the bailed STG is out of range. "Hens and Chicks" be damned. When you have this many 12.2cm guns shooting at you, its over. The Kanon fled his STG to take control of his other vehicle. Only to find the crew had already fled the field. 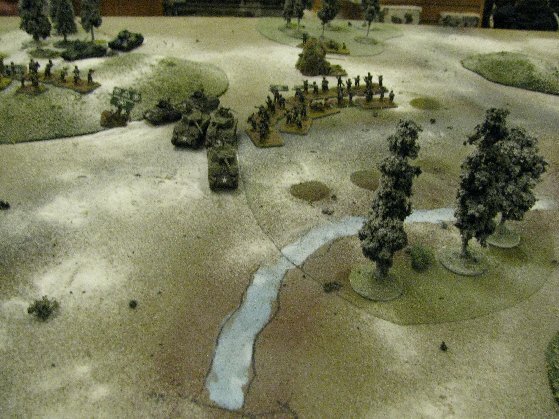 The other two STG's take up defensive positions along the hedgerow. 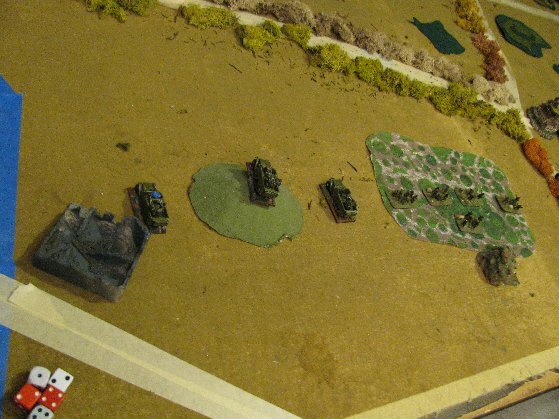 The 89th Guards Mortar Battalion gets a lucky turn and manages to bail the other two STGs on the road and pin the supporting Grenadiers. The 5/1441 Reconnaissance Company get their opportunity to assault the bailed platoon, destroying both STG's, then pull back. On the right flank, the SU's line up on the Grenadiers in the woods, killing one PaK, and an infantry team. The T-34's knock off an armored car. The Armored Car Platoon passed it's motivation test. But we called it here as Soviet win. 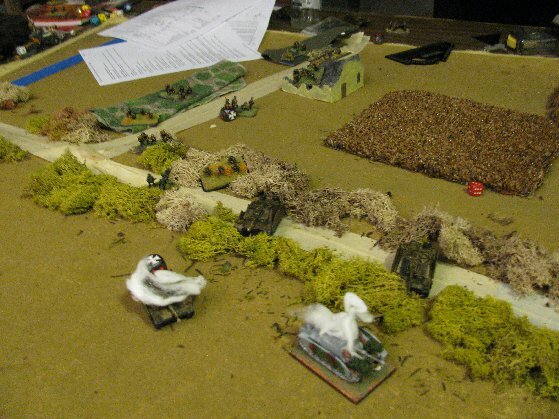 The left side was a draw, no Soviet Platoons have failed, while the Germans only had one Platoon not sitting at 50%. The 5/1441 Reconnaissance Company approaches, assaults and recovers leaving 2 smoking STG's. Final position on the right flank. The Soviets were set to alternately step forward their batteries giving one "volley fire" while the other suffers from "Hens and Chicks". 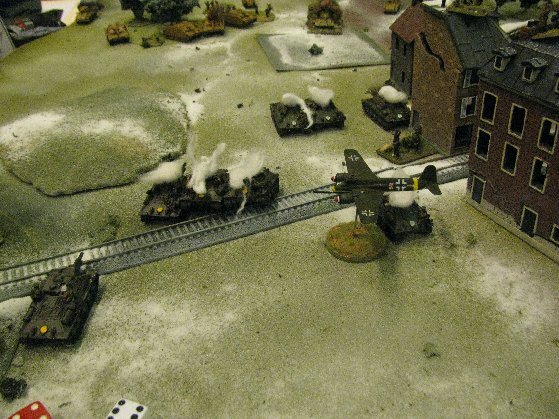 The single PaK-43 couldn't stop them from coming in and taking the objective. Wait a minute. 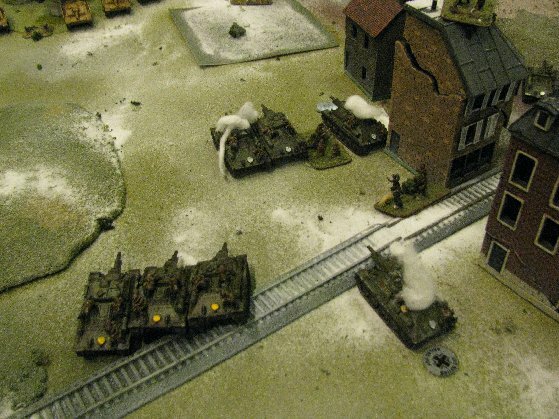 Where is the platoon of 3 Panzer IV's? Why haven't they stepped in here somewhere. Unfortunately, fate stepped in there. One Pz IV was firing into the flanks of the T-34's when available, but mostly he didn't have a shot, or it missed. The other two got bogged crossing the hedge, and even with "re-roll skill checks" there was a never ending series of 1's and 2's. There was no need to belabor the point in the batrep. On turn 7 I detached one of my SU Batteries to face them down should they succeed in unbogging, and attacking them if they stayed bogged. At that point, whether the Pz IV's would have won or lost, they could only have changed the score from a 6-1 to a 5-2. *It has been pointed out to me that Gun Teams cannot "Stormtrooper" after shooting. You learn someting new every day.